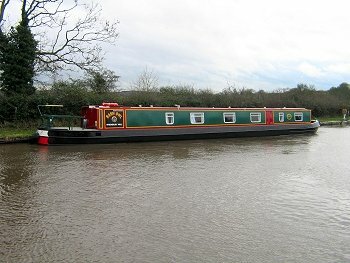 The Wagtail class canal boats. 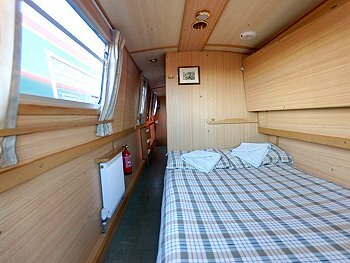 There is a security box on-board the Wagtail Class boats (except from the Gailey Marina). This boat is fitted with free WiFi - an explanation of how to use the WiFi will be supplied on-board your boat on arrival. 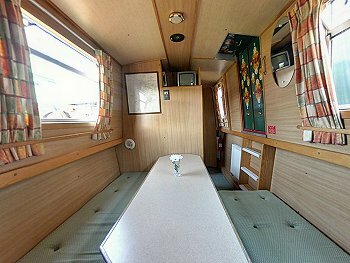 Spacious saloon in the middle of the boat with two sofa's either side of the galley, and removable tables. The two seating areas can both be converted into a double or two single beds using the fold down single in the evening, if required. There is also a 4 speaker radio/CD player, television and a DVD player in the saloon area. 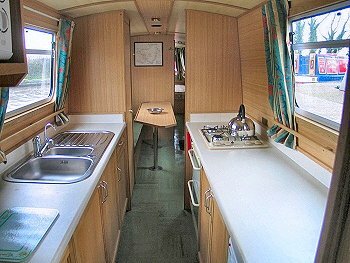 Well-equipped galley with 4 burner gas cooker complete with grill and oven, refrigerator, sink and drainer, work surfaces and storage space. There is a toaster and microwave in the galley. Sufficient saucepans, cooking utensils, crockery and cutlery etc. for the number of berths. Two bathrooms, both with a wash basin, toilet, and a full-sized shower with bi-fold doors. There is also a 240v shaver socket. Large mirror. A welcome pack including 1 bottle of washing up liquid, 1 dish cloth, 1 tea towel, 1 floor cloth, toilet roll & bin liner. Helmsman's waterproofs & Umbrella.